The concept of biochemic cell salts, also known as tissue salts or just cell salts, was developed by Dr. Wilhelm Heinrich Schuessler (1821-1898), a German physician, in the late 1800s. 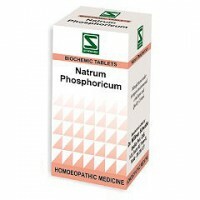 Although moderately diluted and potentized, these remedies are not classed as homeopathic because there are not selected according to the principle of similarity which is essential to homeopathy. They are chemically pure salts, homogeneous to the cell minerals in the human body, physiologically and chemically in close relation to them. 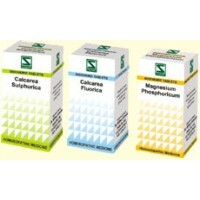 By the aid of Schuessler Salts disturbed molecular motion and imbalance of these minerals in the cells can be corrected thus restoring the health of the individual. 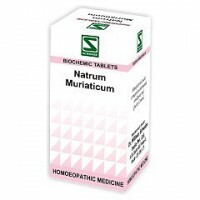 Dr. Schwabe Homeopathy - Schuessler Salt Calcarea Sulphurica 6x Tablets 20 g Has an anti-in..
Dr. Schwabe Homeopathy - Schuessler Salt Kalium Sulphuricum 6x Tablets 20 g Helps to reliev..
Dr. Schwabe Homeopathy - Schuessler Salt Natrium Muriaticum 6x Tablets 20 g Regulates the b..
Dr. Schwabe Homeopathy - Schuessler Salt Natrium Phosphoricum 6x Tablets 20 g Regulates the..
Dr. Schwabe Homeopathy - Schuessler Salt Natrium sulphuricum 6x Tablets 20 g Supports the g..